1.Brush the Lamb chops lightly with oil. Season with salt and pepper, and sprinkle with the rosemary. Preheat the barbecue before adding the Lamb. 2.Cook on one side until the first sign of moisture appears. Turn Lamb chops once only. Test the chops for degree of doneness with tongs. Rare is soft, medium feels springy and well done is very firm. 3.Remove Lamb from heat, loosely cover with foil and rest for three minutes before serving. Toss together the lettuce, watercress, avocado and radishes, drizzle with the salad dressing. 4. 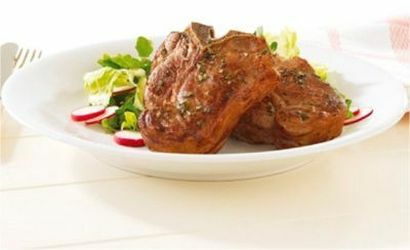 Serve the Lamb chops with salad. Tip: You can use Lamb cutlets, eye of shortloin/backstrap or Lamb fillets/tenderloins for this recipe.